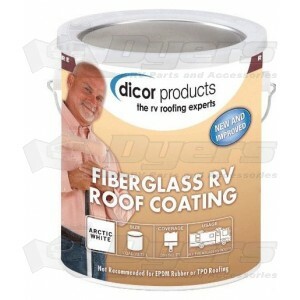 Dicor Fiberglass RV Roof Coating protects and beautifies fiberglass and previously coated RV roofs. Fiberglass RV Roof Coating is formulated with 100% Acrylic Fiberglass resins to form a flexible coating that will expand and contract with the roof movement. Dicor Fiberglass RV Coating is brilliant white to provide a superior reflectivity thereby lowering interior temperatures. Not recommended for EPDM RUBBER OR TPO ROOFING. Remove all loose dirt, oil, rust, chalk, mildew, loose coating or other contaminants, which would prevent maximum adhesion of the fresh coating. Clean fiberglass roof with Dicor Fiberglass Clean & Prep product number RP-FCP-1. Rinse thoroughly and let dry. Prepare surface by rubbing with fine steel wool or sandpaper to provide a slightly abraded surface to which coating will adhere. Rewash with Dicor Fiberglass Clean & Prep. Cover all fasteners and seal around all roof protrusions and vent mountings (vents, lander stanchions, etc.) with Dicor Lap Sealant. Cover all joints and roof seams with Dicor Coating Ready Cover Tape. Cover all fasteners and seal around all roof protrusions and vent mountings (vents, lander stanchions, etc.) with Dicor Lap Sealant. Cover all joints and roof seams with Dicor Coating Ready Cover Tape. Note: Fiberglass RV Roof Coating is For Use on roof surface only. It is recommended to cover the exterior sidewalls as well as front and rear caps of the RV with plastic sheeting to avoid the coating sticking to surfaces other than the roof. If coating comes in contact with any surface other than the roof, wash it off immediately. Apply, un-thinned, at the rate of 350 square feet per gallon, per coat. For maximum performance, two coats are required. Apply each coat at right angles to each other by brush or roller. First coat must be dry before second coat is applied. Under normal conditions of 70°F and 50% relative humidity, the second coat may be applied within 1 to 2 hours at the same rate as the first coat. In order to prevent any chance of “wash off” of freshly applied coating, do not apply at temperatures below 50°F, or when rainfall, cold, darkness or high humidity are expected within 4 hours after application. During these 4 hours, at least 2 hours should be of direct sunlight. Allow 24 hours for full cure. Clean brushes, tools and other equipment with soapy water immediately after use. Dried film is difficult to remove from any surface. If coating is subjected to rain, before it has properly dried, and wash off occurs, it is necessary to immediately wash stained surfaces with soapy water to prevent staining. Warning! If you scrape, sand or remove old paint, you may release lead dust. LEAD IS TOXIC. EXPOSURE TO LEAD DUST CAN CAUSE SERIOUS ILLNESS, SUCH AS BRAIN DAMAGE, ESPECIALLY IN CHILDREN. PREGNANT WOMEN SHOULD ALSO AVOID EXPOSURE. Wear a NIOSH-approved respirator to control lead exposure. Clean up carefully with a HEPA vacuum and wet mop. Before you start, find out how to protect yourself and your family by contacting the National Lead Information Hotline at 1-800-424-LEAD or log on to www.epa.gov/lead. Close containter after each use. Use protective clothing to avoid contact with fiberglass, skin or eyes.